New Delhi: Man-of-the-moment Narendra Modi's tweet after he led the BJP to a landslide victory in the world's biggest elections created history by becoming India's 'most-shared tweet'. "India has won!" Mr Modi, 63, tweeted on microblogging site Twitter, which instantly became a hit with over 61,000 re-tweets and nearly 38,000 marking favourites within a short span of time. As leads from counting of votes gave the BJP a clear majority in the 543 member Lok Sabha, Mr Modi's tweet went viral on the microblogging site. 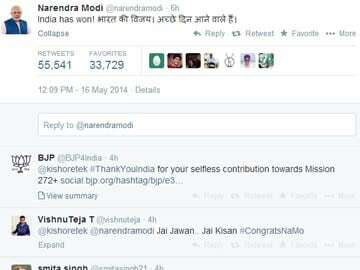 When contacted, Twitter confirmed saying: "Yes, it is the most retweeted tweet till date on Twitter from India. Also, it is the fastest to reach 10,000, 20,000, 40,000 and 50,000, respectively". Till the last count, the tweet had been retweeted 61,277 times and marked favourite by 37,677 users. The tweet, however, has a long way to go before it can compete with global retweet records. The global includes Ellen DeGeneres' Oscar selfie at the 86th Academy Awards and US President Barack Obama's victory tweet (saying "Four more years" with picture of himself hugging Michelle) after his second term confirmation. Obama's tweet was retweeted 774,933 times and marked favourite by 294,571 people. Mr Modi has a huge team of developers and social network specialists, who are supporting his campaign. After the stated tweet, he has also posted a "selfie" with his mother, Heeraben after taking her blessings. His team has also put in place a victory wall, where his supporters can reach out with their messages to Mr Modi. The group has also reached out to BJP supporters through emails thanking supporters for the contribution towards achieving "Mission 272+".